Variable width fill (released in version 1.24) is now available on a wider range of printers, including the Fortus 380mc Fortus 380mc Carbon Fiber Edition and Fortus 450mc. This option does require updating these printers to firmware version 6.1. Instructions for the firmware update can be found here. For those who set up FDM parts in Insight and import their CMB files into GrabCAD, you will no longer get an error if GrabCAD Print is set up for a different machine type than designated in the CMB files. GrabCAD Print will now automatically switch the printer type to that of the Insight CMB file. Speaking of importing CMB files from Insight, the software now gives you the ability to rotate those files on the z-axis, just like you can in Control Center. The Advanced FDM Tool also received a few minor updates, including the option to use variable width fill and the ability to auto-orient parts. If you operate a Stratasys F370, Fortus 380mc, 380mc Carbon Fiber Edition, 400mc, 450mc or 900mc make sure to check out a recent blog we wrote showing how to use GrabCAD Prints Advanced FDM features. It is a ground-breaking new way to setup files, and it is something that should be explored by anyone trying to get more functionality out of their FDM workflow. 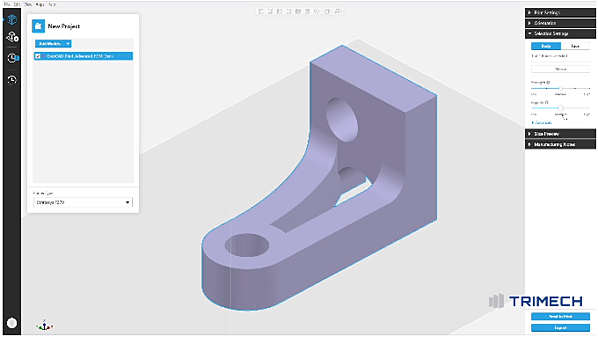 A big boost in efficiency with Connex and J-Series machines is now in effect by GrabCAD Print allowing printers to operate if loaded in incompatible material types (i.e. only one half of the Digital ABS blend, or having both Vero and VeroFlex materials loaded at one time). So long as the print job does not try to use the incompatible materials that are loaded, the project will still be able to print without an error. This is good for allowing customers to reduce the amount of purging when changing materials in a printer by not having to remove more canisters than needed. These version updates have several bug fixes including a launching error that indicated that there were “Too many instances of GrabCAD Print open” and a fix of a part quality issue that could occur with very specific settings combinations when printing with the Hexagram Infill pattern on the Stratasys F123 printers. There is also an update to remove a bug that could indicate a 00:00:00 build time on all jobs in the printer history. Lastly, GrabCAD Print will automatically clear temporary files stored in the app directory when the application is closed. Not yet signed up for GrabCAD Print? Download the software for free by clicking the link below.